Absolute beach frontage: Bathers Beach House, Fremantle (photo: Artist Liaison). As the only place in WA that you can enjoy a cocktail on the sand, Bathers Beach House has Europeanised the charming port of Fremantle, holding its place as the only absolute beach front venue in Perth. With panoramic views, a delicious and diverse menu of quality seafood, Bather’s beach is the perfect pit stop to relax and cool down on a hot summer’s day. A new venue on Fremantle’s Port Beach; Coast’s crisp white, weatherboard beach shack is a refreshing new addition located a mere few metres from the beach. Catering to many scenarios, from larger groups to quiet cocktail-fuelled catch-up’s, Coast is elevated just above the dunes, providing a beautiful Indian Ocean backdrop while you soak up the sun in this beautiful alfresco venue. 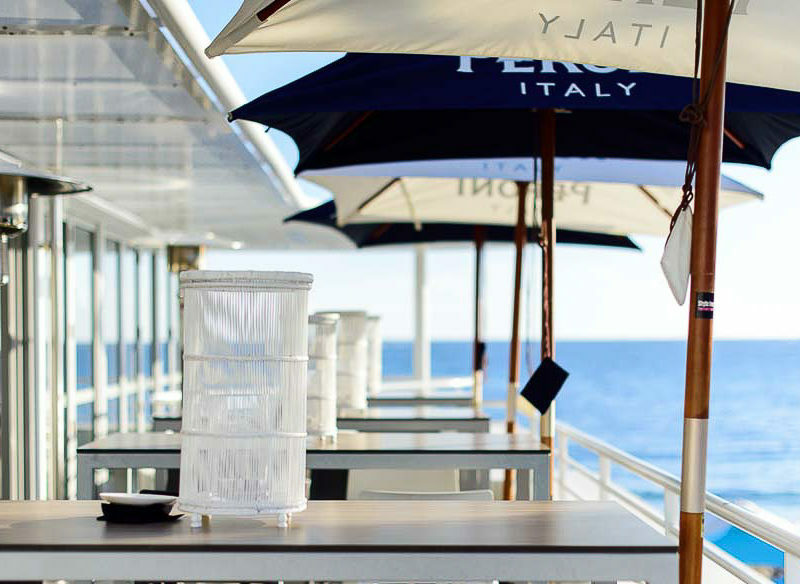 Leighton’s favourite beach-facing venue is set high on a balcony, serving modern Australian cuisine and with a premium wine and spirits list to choose from whilst taking in the stunning ocean views. Just a few steps from the talcum-powder white sands, Bib & Tucker is an ideal pre or post-beach destination to fuel long days by the water. Across from Bib & Tucker is ingenious new venture The Orange Box; a high-end and eye catching kiosk; pleasingly decorated with nautically themed interiors and a wooden row-boat hanging from the ceiling. Unlike your traditional kiosk that sells sausage rolls and Coca-Cola, The Orange Box provides healthy vegan and vegetarian food, a colourful range of quality gelato and, of course, artisan coffee to satiate beach-goers. Funky and great for vegetarian fare: The Orange Box, Leighton Beach. 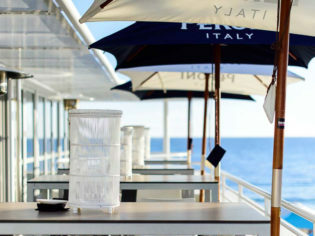 Recently refurbished The Beach Club has already proven to be a bustling hub in the centre of Perth’s most iconic beach. With open, coastal-inspired interiors and plenty of room to lounge, the Cottesloe Hotel is the great weekend spot to retire after a long day in the sun. Only 100 metres from Cottesloe beach, this refined yet casual venue lends itself to good food, a casual drink or an evening at the free outdoor cinema. Bringing you sophisticated modern Australian cuisine with a view, Oddysea has established itself as a favourite City Beach fixture, thanks to ocean views and a beautiful ambiance. Mindful of the coastal lifestyle, you can also pop in to grab a newspaper and a quick coffee at the SSEA kiosk before or after a dip in the ocean. A favourite Scarborough fixture: Odyssea Beach Café.